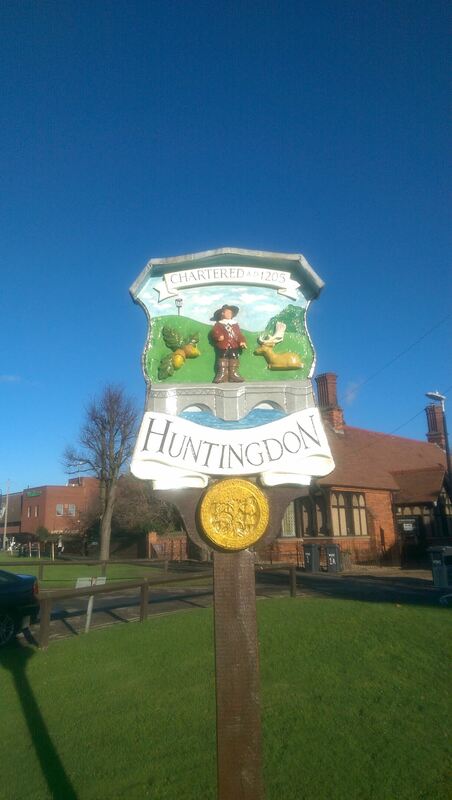 OK, Huntingdon isn't a village, but it still has a cool sign, and to be fair it's a pretty pants town. I can say that; I've lived here for 42 years!!! Huntingdon was founded by the Anglo-Saxons and Danes. Mentioned in the Anglo-Saxon Chronicle, it seems that it was a staging post for Danish raids outside of east Anglia until 917, when the Danes relocated to Tempsford, before being crushed by Edward the Elder. It prospered successively as a bridging point of the River Great Ouse, as a market town, and in the 18th and 19th centuries as a coaching centre, most notably The ****** Hotel. The town has a well-preserved medieval bridge that used to serve as the main route of Ermine Street over the river. The bridge only ceased to be the sole crossing point to Godmanchester in 1975, with the advent of what is now the A14 bypass. The town has been represented in parliament by two prominent MPs: Oliver Cromwell in the 17th century, and a former Conservative Prime Minister from 1979 to 2001. Between the railway station and the old hospital building, stands a replica cannon. In the 1990s the replica was installed to replace an original Crimean War one, that stood there until the Second World War, being scrapped for the war effort. When the replica was installed it was placed in the opposite direction from the original. The cache is only a short walk away from the "village" sign. Please do not go climbing all over the sign!